The next time you pop a pill, you probably won’t think about everything it took just to develop it. We want to develop new medicines and technologies that will help patients, but testing human subjects is risky and time-consuming. As an alternative, researchers have started growing comparable versions of human body parts in the lab, specifically to test new treatments. Now a team from the Cincinnati Children’s Center for Stem Cell and Organoid Medicine has added another body part to the list we can grow on demand: the esophagus. The human esophagus is a tube, about eight inches long, that connects the throat and the stomach. The researchers grew a smaller version of the esophagus called a human esophageal organoid. 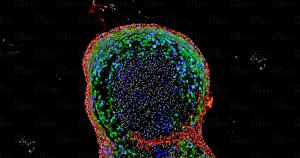 In research published Thursday in the journal Cell Stem Cell, scientists began with pluripotent stem cells (PSCs), “master cells” that can grow into any tissue type. By targeting the expression of a gene known to affect esophageal formation, they were able to trigger the PSCs to grow into esophageal tissue. Within two months, they had a lab-grown mini-esophagus, less than a tenth of an inch long. When the researchers compared the lab-grown esophageal tissue to tissues biopsied from patients, they found the two were “strikingly similar in composition,” according to a press release. That means the lab-grown versions will likely be useful for medical testing. The researchers’ next goal is to identify projects that could put their lab-grown esophagus to therapeutic use. Given today’s influx of funding for biotech research, that likely won’t be hard.